Discussion in 'Recruiting Archive' started by Jared Grubbs, Aug 26, 2017. SpartanDawgs, the_speakers_lab and #60 like this. 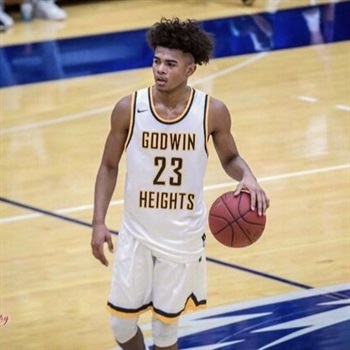 The Wolverines appeared to be the team to beat in the Grand Rapids area heading into Tuesday’s season opener with a pair of Division I commits in Lamar Norman and Markeese Hastings leading the way, and the two didn’t disappoint. Hastings, who has committed to Butler, scored 23 points, including 11 in the opening quarter to spark the Wolverines early." Interestingly enough, Hastings’ teammate Lamar Norman just decommitted from UTEP. Seems like he has a lot of upside and athleticism and is listed as a 3 star on rivals. Also, had a previous offer from Milwaukee which I’m assuming was from LaVall? Might be something to look into for the staff. If he’s athletic and can shoot, sign him up. Those types tend to do well in the college game. What's the tweet say? It won't come up, thanks! 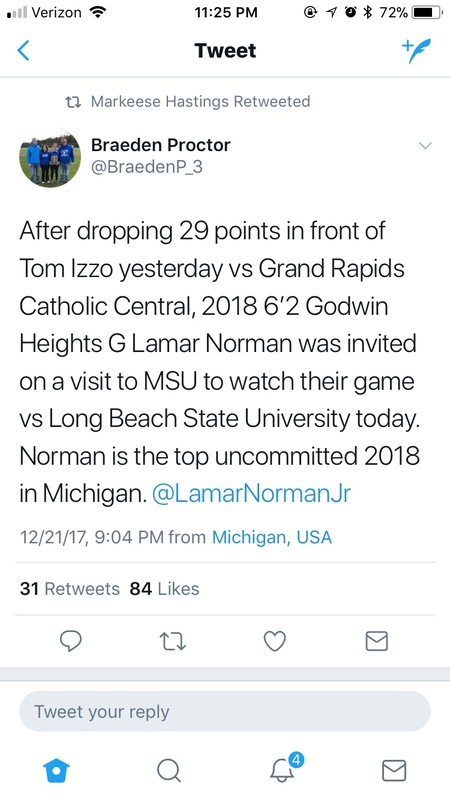 My brother in law coaches in the Grand Rapids area, was at the game on Friday night, and has heard that Norman very much wants to go to Butler. He was impressed with his game on Friday, very quick, made good decisions, knocked down several 3's. He said he was actually more impressed with Norman than Hastings and that is no slight on Hastings. joliebeth23, DawgPoundMac, BHayden and 1 other person like this. I think everyone would be more than happy to welcome Norman if the Butler staff wanted him and if he the academics are there. I don't know about everyone, but I think most would welcome him. Offensively, I think he looks like he's got the tools to be a good player in college, my only concern is what kind of defender he can be in college. He looks to be a good enough athlete, I just think he looks like he could use a little more bulk or strength, but without having seen him on defense in his videos, it's a little difficult to really know. Butler needs a stud scorer at the 3/4 spot next year, but save for having another stud or two that can go get their own buckets if necessary, I think Butler's got some nice pieces in place. Shimmy, NCJon, PSUButlerFan and 12 others like this. That's the news we've been waiting for. Wondering if Markeese will come with. Let's lock this kid up in Hinkle! Great news! Don't let him off campus until we have a commitment. SpartanDawgs, BHayden, DawgPoundMac and 2 others like this. DawgPoundMac and MSUDawg like this. It's definitely good news. Two guys that have played together for years and can score/rebound. It will be loud that game so he'll get the full Hinkle effect. Let's go Dawgs, we need to win this one. What AAU team did Lamar Norman run with this Summer? When exactly did Norman commit to UTEP? Would be a great victory for the dawgs. LaVall and co always on it imo. Just need to close.